Small group. Av. 12-18 people. 7 nights in standard local hotels. Accommodation, transport, listed activities, alongside tour leader and local guide(s). The majority of accommodation used on this trip is locally owned and in which you experience great food, most of which is sourced locally, and lovely Sicilian wine. This not only provides direct employment within the hotel, but also has the effect of percolating money beyond to small businesses that supply the hotel and in this way money is spread throughout the region we visit. Other people too benefit from our visit includes drivers and local guides, as well as the staff in our local handling agent's office, which is based on the island. Etna was one of the highlights. Opt for the optional excursion to Mt Etna! Very busy, as expected, but very enjoyable with the exception of the appalling chaos at Catania airport, waiting over an hour to be checked in by one checker for all the Alitalia flights leaving Catania that morning, while the express check-in had two operatives. The crowning glory was that our luggage never left the airport. I await its arrival with eager anticipation! Visiting outstanding classical sights such as the quarry in Syracuse where 7000 athenians were enslaved, or the temples of Akragas, the theatre of Segesta carved into the hillside, the island of Motya overrun by Dionysius. The Palatine Chapel in Palermo is breathtaking. This is a very busy schedule. Be prepared to feel that you haven't had enough time at many of the sites. The local people need the tourist income, and I guess at least some of the fees from the sites finds its way to conservation projects. 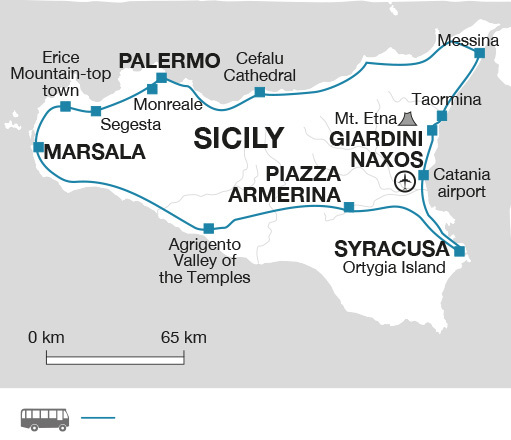 A lightning tour of some fabulous sites in Sicily. A bit like a fine dining taster menu that leaves one wanting more. Siracusa - the Greek Temple in use today as the cathedral. Travel in the shoulder months.